HP has unveiled their new business desktop PCs: the HP dc5850 and HP dx2450. 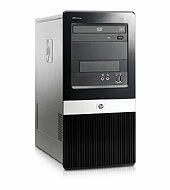 The HP dx2450 is a microtower PC packed with AMD processor. Users can choose from AMD Sempron, Athlon, or Phenom processors. The HP dx2450 has a maximum 4GB of memory, and includes an Integrated NVIDIA GeForce 6150SE Graphics or choose between the optional NVIDIA GF 8400 GS (256 MB SH) Single Head (PCIe x16 or ATI Radeon HD 2400 XT (256 MB DH) PCIe x16 graphics card. Standard ports for the HP dx2450 includes: Standard: 6 USB 2.0, 1 microphone in, 1 headphone/line-out, 2 PS/2, 1 external VGA monitor, 1 audio in, 1 audio out, 1 RJ-45, and 1 microphone in. The HP dc5850 also features AMD's business class processors and an integrated ATI Radeon 3100 graphics with support for DirectX 10 technology. Specs for the HP dc5850 is not yet available at HP's website but it is expected to be available on May 5 at $599.